The light is gorgeous on your globe and so glowing! Thank you so much. 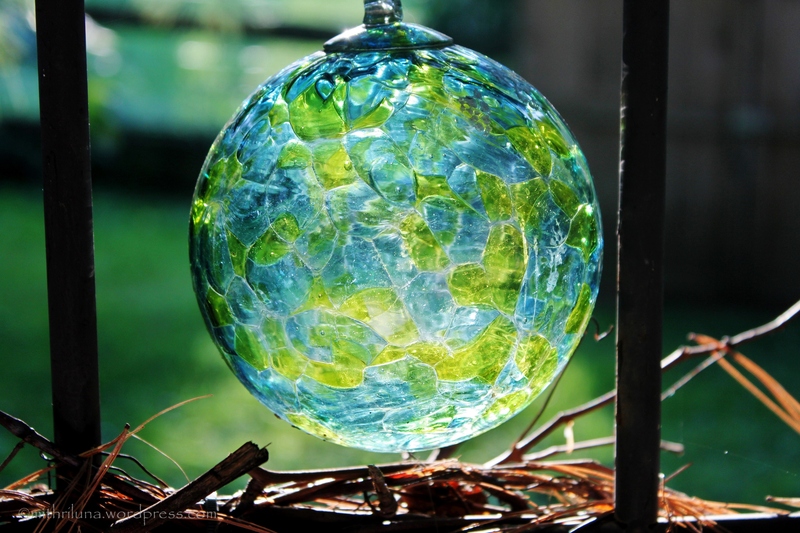 The picture was taken in my brother-in-law’s garden where he has many beautiful glass globes. Thank you so much! Thank you for stopping by my blog! I would love this globe! I like to hang things in my garden to catch the light, but I’m sure this is the prettiest one I’ve seen. Perfect for the theme! After I saw this globe (and many more) in my brother-in-law’s garden, I have decided that I must include some in mine. I actually have a few globes that I hang on my Christmas tree but I may take a couple and save them for my garden. 🙂 Thank you for stopping by and commenting! Yes, It’s a beautiful globe. Thank you! Thank you for visiting! Lovely shot. Thanks for visiting my blog. You are definitely a super-mum with nine kids, a job and a blog! REALLY pretty. And a nice shot of it too! B4 Retouch: Père Lachaise Paris | What's (in) the picture?